So, Monday morning, just a day after the members of the team returned to their homes for a refreshing break, I find myself boarding an early morning Kingfisher flight from Mumbai to Kolkata to meet Sourav Chandidas Ganguly in his citadel. For a long time – almost since 2005 when the cards had begun to be heavily stacked against him – the swashbuckler had evaded all overtures from the press, preferring to recoup quietly in the wings. Finally, late last month, the erstwhile captain and current member of the Indian squad – who’d kept his hand in the game by playing in domestic and county cricket – decided it was the right moment to speak out and be counted. And, so it is that I am air dashing to the capital of Bengal – fretting anxiously as photographer, Colston Julian, is hustled on to the flight just in the nick of time. At the Netaji Subhash Chandra Bose Airport, our vehicle awaits us…. I ask Deen Dayal Singh, our driver for the day, if he is 100 per cent sure where Ganguly’s house is; giving me an amused glance in his rear-view mirror, he assures me quickly, “You cannot live in Kolkata and not know where Dada stays,” before speeding out of the airport. A series of thoughts run through my mind as we get closer to our destination. Have the glorious uncertainties of cricket mellowed the man often referred to by the Australian press as ‘Lord Snooty’? Reportedly one of the few players in the history of modern Indian sport with the temerity, ambition and stature to take on the colonial rulers at their own mind game of arrogance, aggression and indifference – what is Dada like, away from the pressures of the pitch and the limelight? In response to my message that we are outside the closed gates, he urges us to drive in. The darwan swings them open and our taxi slides to a halt right in front of his swanky, red convertible. A narrow pathway leads to a big ground floor room, that his Man Friday, Santosh Singh, shows us into. Photographs, trophies, memorabilia…there is ample evidence of his prowess at different stadiums across the globe. At the appointed hour, the door opens and he walks in quietly…. 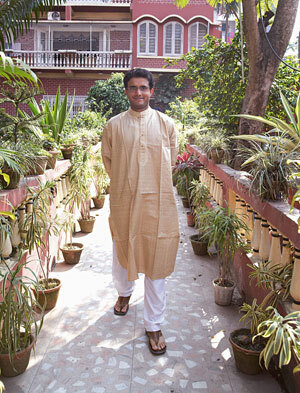 Clad in a saffron kurta and white churidar, he is the spiffy image of the archetypal Bengali bhadralok. “This is what I am like when I am at home,” he smiles, shaking hands and settling down on the curved sofa, while calling for some chai, mithai and snacks…. For the man who had once said, “World Cup 2007 is my goal and I believe that I have enough cricket left in me”, the exile has ended at perfectly the right moment. His ‘second coming’ is seen as the timely resurrection of a man who dreamt big for his team. 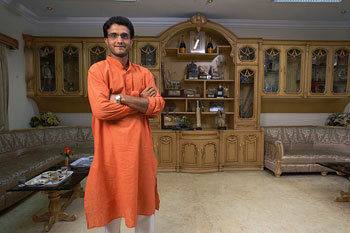 For Ganguly, life for the last two decades and more has meant a sport of some kind or the other. While his elder brother, Snehashish, played cricket, and his father was associated with the cricket association of Bengal, young Sourav first played soccer at school. Till Circa 1983 happened and ‘Kapil’s Devils’ brought home the World Cup. “I was a regular ordinary boy, the mild sort who would not hurt anybody. Living in a joint family, I grew up amidst a whole brood of cousins, which was a great thing. We played cricket and football in the maidan outside my home,” he states, pointing to where buildings have since come up. “At festivals, particularly at Durga Pooja, we would get identical clothes and shoes and end up looking like a band. My mother put me into many classes – I played football, learnt painting and of course, studied. There was a lot of pressure to do well in school. I was a good student till class 10 which is around when I was picked up for the state Ranji team…,” he remembers. Mention of his captaincy brings back a surge of memories, a kaleidoscope of images that spelled aggression, innovation and the hunger to win. 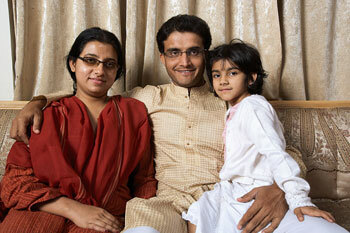 True to his name, Dada proved to be a tough, intuitive and uncompromising leader. Under his stewardship, India started winning matches almost right away and forged a remarkable run that took them all the way to the World Cup final in 2003. Ganguly tried all the tactics in the sport – he did not hesitate to indulge in mind games, turning up late for a toss or sledging when the occasion rose, just to rattle the opposition…. Very few people know that the Gangulys own Asia’s third largest printing press and his family business is an option for the man with a management degree under his belt. “I would not really like to turn commentator as other former cricketers do; after travelling for so long, I would prefer to be closer home,” he says. Also on his horizon are several charitable ventures: a school in Kolkata and a hospital in Siliguri. His school of cricket too bears his imprint.